Virtu USA - Black - Bathroom Vanities What is the palette of your bathroom? Is it composed of light hues or darker shades? Finding the right cabinet finish to match your bathroom can be very important. No matter if you find a Black bathroom vanity or maybe a lighter hickory vanity cabinet, you should definitely consider the overall look and feel of your bathroom. 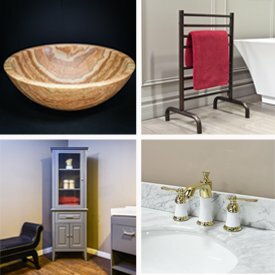 Find the perfect solution to your bathroom decor from top brands like Virtu USA. At Luxury Living Direct we offer a variety of different vanity finishes including Black to fit your desired decor. Call (800) 574-3022 if you are ordering 2 or more vanities and see if you can get a special discount!